Until recently, France was considered a high taxation country. While this can still be true if you are in certain social groups - France has a wealth tax, for example - for many average UK residents, France is not the expensive tax option it once was. As the popular phrase goes, the only things you can rely on are death and taxes. Not a very cheery thought, but true nonetheless. One of the most common questions people who are thinking about starting a new life in France will ask is 'Is the cost of living cheaper?' - taxes play a large part in how to answer that, alongside lifestyle and cost of housing. Many people who have already started their new life in France find that their cost of living is either similar or a little lower in France, mainly due to the fact that they enjoy more fresh food (cheaper than processed food), are able to go to the beach at school holidays (cheaper than a day out at a theme park, for example) and are less concerned about keeping up with the Jones's. However, many people also find that their earning power has severely diminished since moving to France, so they have less money to spend anyway. There are two main taxes connected to your property - taxe d'habitation and taxe fonciere. Most expats consider them to be lower than the equivalent council tax in the UK, although it can depend on where you are living and whether the euro exchange rate is working in your favour. Taxe d'habitation is a local tax, collected by your local council, once a year. It is only payable on habitable properties, although the definition of 'habitable' has been rather stretched - you only need electricity and running water. This is payable by the owner of the home, regardless of whether they are living in the house for all or part of the year. If the house is occupied by tenants, they are responsible for paying the tax, although the bill will go to the owner of the property. If the owner rents out their home as a 'holiday let' rather than a tenant/landlord arrangement, then the owner is liable to pay the tax. Although the bill is received annually, a year in arrears, you can arrange with your local mairie(town hall) to pay it in monthly instalments, just take your tax forms in plenty of time, with another form of identification. The cost of the tax varies from department to department and the size of your house. 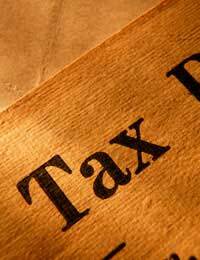 Taxe fonciere is a country-wide tax payable annually, collected by the government. If you have bought a newly built home, you have the first year free. This tax is payable by whoever was living in the house on January 1st, so if you buy your home part way through the year it is common for the vendor to ask you pay them back the proportion of the year they will have already paid for. France and the UK have a 'double taxation treaty agreement'. This means that British or French residents in either country will not pay tax on the same earnings twice, although they are expected to pay the higher amount. You must get specialist advice before embarking on your new life in France, as the taxation rules are both clear and complicated, depending on your employment or retirement situation. There is a great deal of information available about the best way to reduce your tax liabilities, although the French system is run with more of a family focus. Once you arrive in France it is worth taking a trip to your local tax office (hotel des impots) as their staff tend to be very helpful and there is usually someone with excellent English, especially in larger towns and cities.